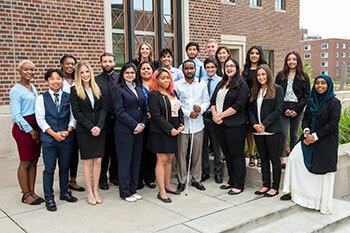 The 2018 University of Minnesota TRIO Ronald E. McNair Scholars presented their summer research in August at the annual poster research symposium. The poster session highlighted the research efforts of 20 McNair scholars, including five CEHD undergraduates and five CEHD faculty mentors. The McNair Scholars program is one of three U.S. Department of Education funded TRIO programs housed in CEHD. The program seeks to increase the doctoral program application, matriculation, and degree attainment by underrepresented and first-generation college students. The cohort included students from the University of Minnesota Twin Cities, Carleton College, and Macalester College. 2018 CEHD McNair scholars and/or faculty mentors are: Muzamil Ibrahim, Youth Studies, and faculty mentor Katie Johnston-Goodstar, School of Social Work; Kania Johnson, Family Social Science, and faculty mentor Chris Uggen, (CLA) department of Sociology; Kimberly Knourek, (CLA) Child Psychology, and faculty mentor Ann Masten, Institute of Child Development; Brianna Lundgren, (CLA) Psychology, and faculty mentor Megan Gunnar, Institute of Child Development; Nicolas Mendivil, Kinesiology & (CLA) Psychology, and faculty mentor Beth Lewis, School of Kinesiology; and Cristaly Mercado, Special Education, and faculty mentor Keisha Varma, department of Educational Psychology. View the list of all scholars and their research projects.